Address: 108 E. Ida St. 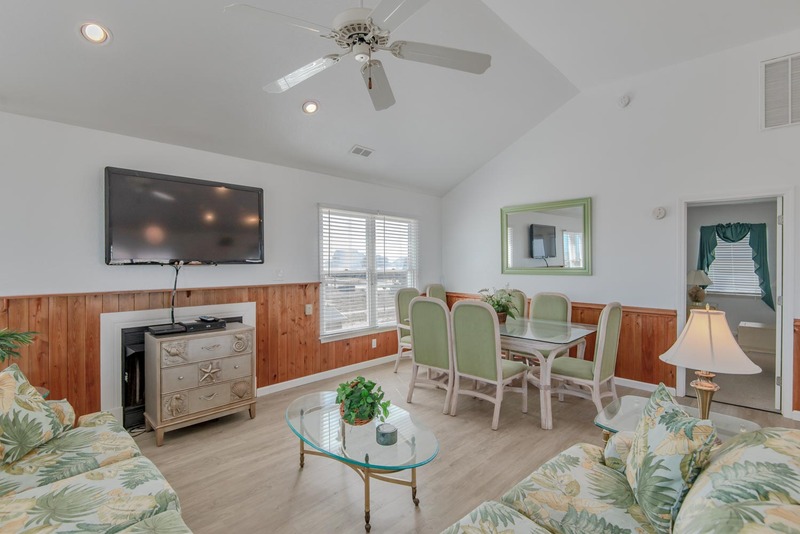 Enjoy Great Views of the Atlantic from this Lovely Oceanfront Home located in South Nags Head. Nicely Decorated & Well Equipped, this Vacation Retreat is a Wonderful Choice for Your Family Get-a-way. Take a Leisurely Stroll on the Beach or Soak Up the Rays & Ocean Breeze from the Sun Deck. In the Evening You Can Relax & Watch the Surf from the Hot Tub located on the Mid Level Covered Deck. Ground Level: Parking for 4 Cars, Covered Entry, Laundry Area, Enclosed Outside Shower, & Access to Beach (Beach Access Adjacent to Property & Only Steps Away (app. 25 Ft.)). Mid Level: 4 Bedrooms (Master Suite w/King, TV, & Full Bath, 1 w/Queen, 1 w/2 Singles w/Adjoining Bath, & 1 w/2 Singles), & Covered Deck w/Hot Tub & Ocean Views. Top Level: Spacious Living/Dining Area, Cathedral Ceilings, TV, DVD, Gas Fireplace, Fantastic Ocean Views, Very Well Equipped Kitchen w/Wolfgang Puck Cookware, Half Bath, & Master Suite w/King, TV, & Full Bath. Features include: C/AC & Heat, Washer/Dryer, Dishwasher, Microwave, Keurig Coffee Maker, Ice Maker, Phone, 4 TVs, DVD, Wireless Internet, & Bike Path. No Pets. This is a Non-Smoking Unit. The house was lovely and clean and we had nice time. We loved staying here and had no issues at all during our stay. We loved the location, size, close beach access, views, and the hot tub was a big hit. We loved the decks to watch the ocean and the outdoor shower was such a help to get sand off before entering the home. Loved the beach, the area, the house, and it was a perfect size for us. So sad to leave but I'd recommend the home to anyone and would absolutely come back. Thank you for another memorable family vacation in OBX! The layout of the house worked perfectly for our 3-generation family vacation. Loved the location and view. Kitchen was well stocked, hot tub was a blessing and hub enjoyed all the cable channels.